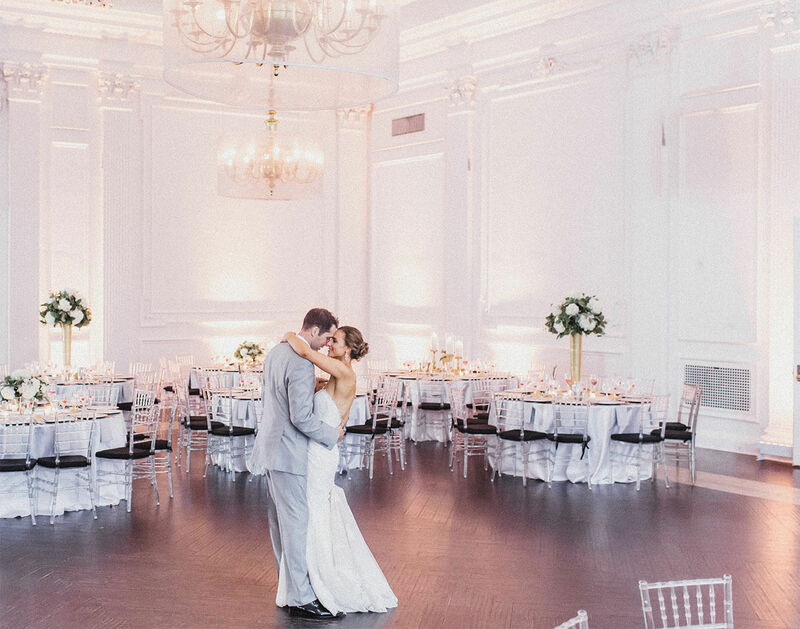 With tall windows that directly overlook Independence Hall and command sweeping views of Old City and the Delaware River beyond, the Down Town Club makes an unforgettable impression on every guest. An effect even further enhanced by the inlaid marble floors, hand-carved moldings, rich mahogany paneling, and other examples of the Club’s Georgian Revival elegance. This rich blend of American history, subdued luxury, and Cescaphe’s singular flair all seamlessly combine to create an unforgettable wedding in the classic tradition. The Down Town Club welcomes guests to your ceremony with a breathtaking view overlooking Independence National Historical Park. The stage is set with romantic draping to create a clean, classic background for all of the ceremony’s special moments. Rich color, texture, and history entertain guests as they await the bride or groom’s graceful entrance. Photographers appreciate the modern and elegant details in every shot. 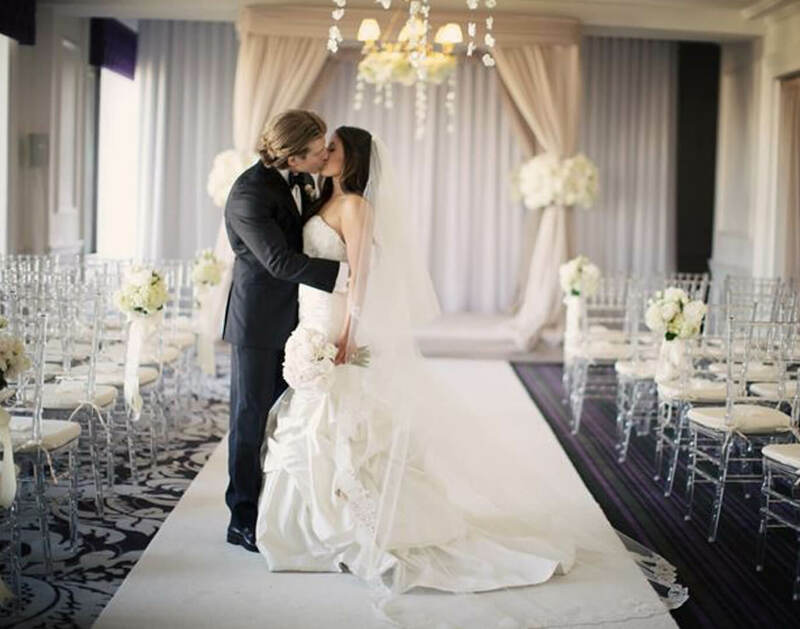 When you opt to host your ceremony at Down Town Club, we will add an additional half hour to your six hour affair. Down Town Club weddings feature Cescaphe’s signature cocktail hour-and-a-half. The venue features two separate cocktail spaces: The Foyer and the Main Cocktail Room. The Foyer serves as both the entryway to the Down Town Club and your first cocktail hour space—with a champagne welcome for your guests, and heirloom tables to display photos and place cards. The Main Cocktail Room overlooks Independence Hall from floor-to-ceiling windows. It is furnished with high and low tables topped with votive candles, lucite chiavari chairs, and an elegant baby grand player piano. 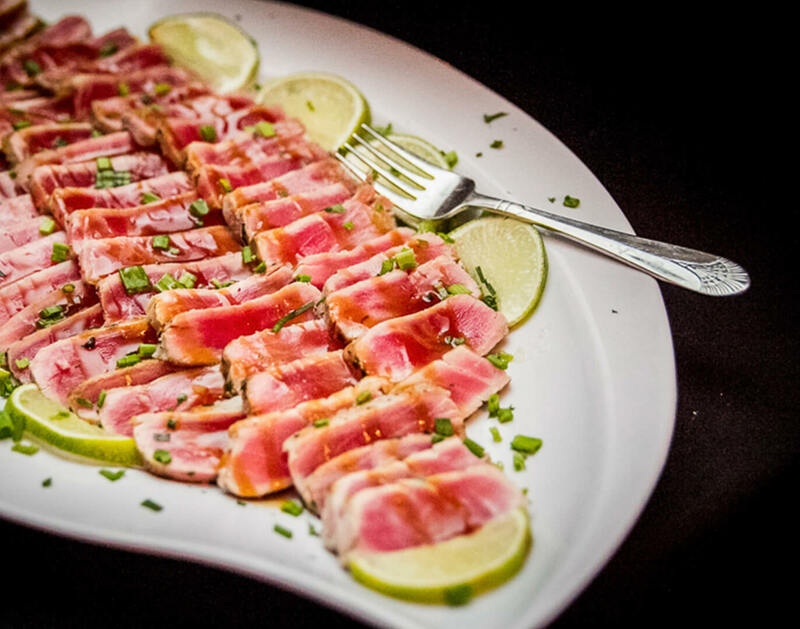 The Room also features two chef-attended action stations, a customizable ice sculpture, famous raw bar, and full service bar. Down Town Club receptions are hosted in the Grand Ballroom. 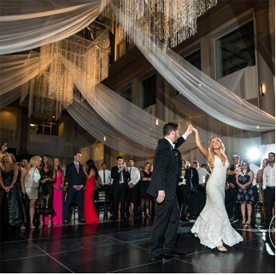 With original brass chandeliers updated with sheer organza drum shades, towering ceilings, and elegant draperies, guests are surrounded by elegance as they survey panoramic views of the city in a time-honored venue that radiates the richness and history of a space nearly a century old. Let us delight you with the features of your next wedding venue. Click Here to learn more. 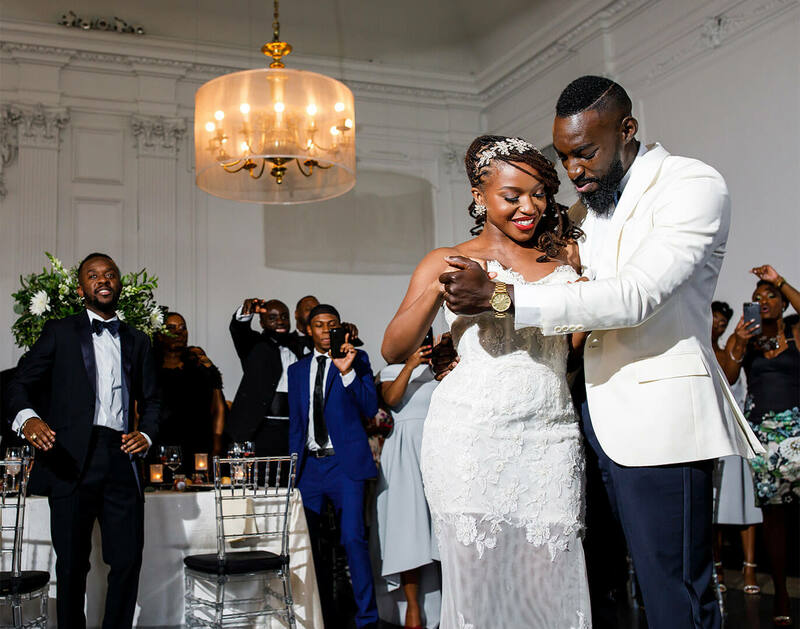 We got married at the Down Town Club and the entire experience – from the planning to the day of – was perfect! From our venue visits, to contracting, initial planning, making selections, and finally, the day of service – everything was incredible and they made us feel so comfortable. 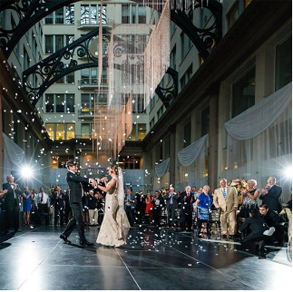 Cescaphe knows what they are doing when it comes to planning and executing a wedding! Leading up to our wedding, our Event Manager was so kind and helpful, we were so excited to see her on the day of our wedding! The staff at the Down Town Club (especially our Maître D) made us and our families feel like kings and queens – they were so kind and accommodating. No detail was missed. Finally, if you are interested in Cescaphe, then you’ve already heard about the food – it is over the top and incredible! We have received countless compliments from our friends and family on The Down Town Club and it couldn’t have happened without the team at Cescaphe. We can’t recommend or thank them enough! Almost a month later, our guests are still telling us how this was the best wedding they’ve ever been to. I had been to weddings at a few Cescaphe venues before we selected the Down Town Club. The food is always top-notch. Come HUNGRY and THIRSTY! And try not to miss your cocktail hour – it’s too delicious. But if you do, there is a Maître D assigned to you and your new spouse who will take care of anything you need. There was also a server assigned to each of our parents, so they were completely attended to. Beyond the food and service that is customarily excellent with all Cescaphe weddings, I think the beauty of the Down Town Club is unmatched. You’re on the 11th floor of a building just across the street from Independence Hall; the windows offer stunning views (our out-of-town guests, history buffs, and even Philly locals were all amazed!) There’s also a baby grand piano in the cocktail area, which we hired a conservatory student to play, such a nice touch. You and your guests will love this space. Plus, the all-in-one price per head (food, open bar, tax, tip, cake) makes budgeting simple. The Cescaphe team is all pro’s. My wedding at the Down Town Club was an absolute dream come true. My husband and I had been to a few Cescaphe weddings at their other venues but knew instantly that the Down Town Club was the right one for us. The classic and sophisticated style fit us perfectly. We love living in Philadelphia and wanted to give our guests a true Philadelphia experience – the DTC hit the nail on the head! I loved that there weren’t any hidden fees that we ran into when looking at other venues. The venue, food, table linens, cake, etc. is all included. the variety of food is unprecedented. We really wanted our wedding to be DIFFERENT and not have your typical chicken and potatoes entrées. We loved all of the choices and our guests absolutely raved about them and the top shelf bar was fabulous as well. My husband and I had our own personal Maître D and he took care of our every need. Our parents also had tons of special attention and they loved the special service. Cescaphe is the way to go ESPECIALLY the Down Town Club! There truly are not enough words to explain how thrilled we are with having chosen The Down Town Club for our big day. Having planned a wedding from across the country, attending to minor details or ensuring that everything would go as planned sometimes stressed me out but the team at Cescaphe reminded me throughout the process that they were there to make sure everything went as planned. I could not have imagined my day more perfect, and I owe most of that to the amazing staff at Cescaphe. Everything was spectacular, from the decor through Beautiful Blooms and the accessories of mine that were so beautifully set around the venue, to the views and the absolutely phenomenal food. To say the service provided by our Maître D’s were a step above the rest, truly doesn’t even touch upon how wonderful they were. Thank you, Cescaphe for making our day perfect! I am a demanding NYC sales exec who wants everything perfect on the first try. I looked at a ton of venues in NYC but growing up in PA had a hunch that I might find the perfect venue in Philly. I love history and Old City and was lucky enough to stumble upon Cescaphe in my search. I can’t give my Sales Manager enough praise. She was so professional, friendly, straight forward and helped with me so many things that were not part of her job. I run a team of sales and marketing professionals and she is one of the best reps I have ever had the pleasure to work with. I chose the Down Town Club the second I walked through the doors to the ballroom, it was the perfect. The night of the wedding could not have gone more perfectly. The food was incredible (people won’t shut up about it still), the staff was incredible, the venue looked stunning and the event was run perfectly. My NYC friends all said it was the best wedding they’ve ever been to and the best assortment of food. It’s all because Cescaphe knows how to run a wedding like a boss. Our Event Manager made my life so easy. I didn’t have time to plan a wedding and she rolled with my tardiness and helped me figure things out last minute. She was so friendly and was so fun to work with, a total pro. With Cescaphe you get a Maître D for your wedding day. I didn’t really think much about this in advance and honestly didn’t know what to expect. When I say our Maître D was a dream come true, I mean it. I could go on and on about how great he was, but I think the fact that my band emailed me specifically to rave about him says it all – “The Maitre D’, Andrew, was totally top-notch. He communicated with me so well all night and never left me guessing about anything. Any time I was wondering how much more dance music we’d be needing, as soon as I’d look up, he’d be there waiting to tell me. 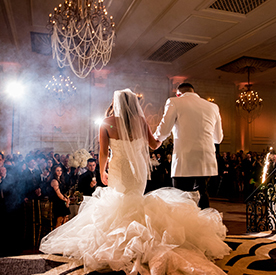 He made things SO easy.” To wrap things up, BOOK THIS VENUE, it was a dream! Weddings are filled with memorable moments, just waiting to be captured on camera. Here are some of our favorites.